U*NIQUE: being the only one of its kind; unlike anything else. Distinctive, individual, special, idiosyncratic, quirky, eccentric. The Cowboy Downhill at Steamboat. Ikon Pass photo. The Ikon Pass is steeped in the idea that a sense of character is essential, that individuality is special, and that these ideas, every one of our 38 distinctive personalities, they should all be celebrated and showcased, because that is precisely what makes a destination unique. It’s okay to be a little bit quirky and to let your freak flag fly. In fact, we champion that. That’s how we roll – and ski and snowboard – too. So, if you’re hunting for those adventures that are a little bit different, those memories that are infused with a little bit more of that something special, then the Ikon Pass is what you’ve been seeking. Throngs of lively Brazilian skiers, world-renowned Chilean vino, massive outdoor hot tubs, and icy-cold pisco sours, all adorning slopes set above tree line. Yeah, you could say there’s more than a touch of character in Valle Nevado, Chile. It’s true, and it’s incredible. Steamboat has an entire, bronco busting day of events dedicated to professional cowboys. 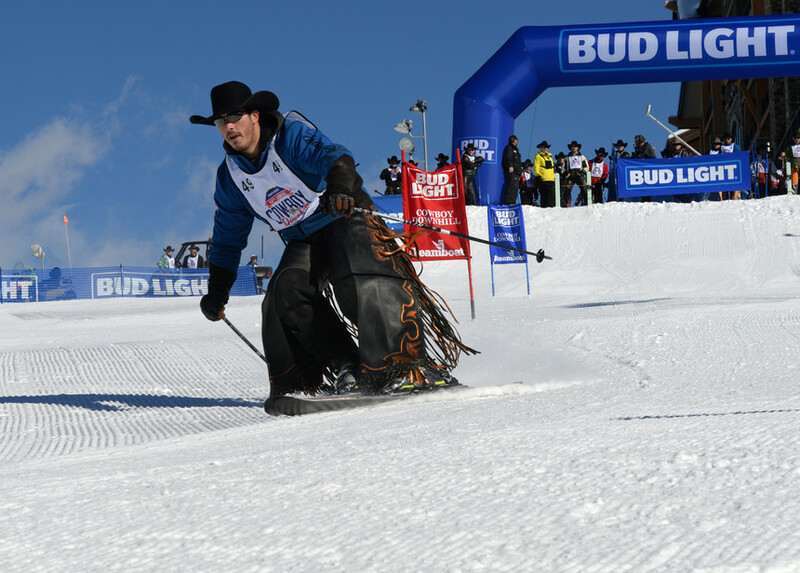 In mid-January, members of the Professional Rodeo Cowboys Association (PRCA), Professional Bull Riders (PBR) members, and State Rodeo queens, all don their cowboy hats and chaps before taking to the slopes to compete in a series of races. Imagine it, over 100 cowboys – some of which have never skied – all busting downhill tail in the Stampede, a no holds barred event where the first cowboy to the bottom wins. Giddy up. It’s June, you’re in New Zealand, and it’s time to celebrate the fact that it is winter. Every Wednesday, Friday, and Saturday night through September, Coronet Peak keeps the runs open until 9pm. Skiers and riders can soak in iconic sunsets from atop the peak before speeding down floodlit trails. At the base, gather around the fire with a Coronet Peak Pale Ale and dance along to tunes spinning from a live DJ. Biei-cho veggies come from the island of Hokkaido, Japan. Michelin stars come from France. Worlds collide when you have the unique opportunity to experience both at Asperges. Serving locally sourced, Biei-cho veggies, this Michelin Starred French-inspired fine dining restaurant located at the base of Niseko’s Hanazono Resort, in Japan, is an experience all its own. Get some education while seeking the unique, quintessential mountain beauty that is Aspen. Offering a break from the up and down mechanics of traditional skiing, the Aspen Center for Environmental Studies (ACES) provides free, daily snowshoe and ski tours on Aspen and Snowmass. Led by a knowledgeable naturalist, travel mountain streams and explore along ridgelines while learning about the mountain ecology that makes Aspen special. Leave it to Michigan to curate a novel experience that combines active adventure and destination dining, all wrapped up in a winter cloak and set to take place across a ski mountain. Boyne Mountain’s Summit-To-Stein's Snowshoe Supper starts with a scenic ride up the historic Hemlock chairlift where passengers are met with warm spiced wine or hot cocoa at Eagle's Nest. Warmed to the next step in the experience, and with snowshoes on, travelers descend Cold Springs run, refueling at the halfway point with another round of warm beverages and a mid-mountain bonfire. Finally, with appetite in hand and live entertainment to provide the ambiance, trekkers arrive at Stein Eriksen's to gather around a three-course meal. Home of a truly extraordinary event, Lake Louise hosts the Ice Magic Festival every year from January to February. A wonderland of winter enchantment surrounds visitors as they wander atop the frozen lake while ice artists from around the world showcase technical artistry in an ice carving competition. In the weeks following competition weekend, lace up your skates and glide through the serenely scenic frozen sculptures – as well as the custom cut ice castle - on one of the most spectacular skating rinks in the world, as voted by CNN. Let the sun, and then the moon, guide you through a marathon ski experience at Stratton, in Vermont. Happening mid-March for seven years running, 24 Hours of Stratton invites the community to come together for 24 hours of turns and a fundraising effort that supports children of need. Enjoy alpine lit trails, team competitions, around-the-clock ski and ride action, live music, fireworks, and, of course, first tracks at sunrise. Sign up, strap in, and make a name for yourself in the Town Race Series, hosted by Big Sky in Montana. Taking place on their NASTAR course – short for “National Standard Race,” and part of the world’s largest public grassroots ski racing program – you can compete over a series of weekly races to become a local legend as the fastest skier in town. Community is the underpinning of culture in Taos. A testament to this idea, the Taos Ski Valley's Speaker Series Program is a weekly program that aims to educate and deepen visitors understanding of Taos Ski Valley. With talks given by over 40 organizations and individuals who make Taos the community it is today - from astronauts to quartets to anglers - each week is a new opportunity to learn a little more about all that makes Taos unique. The cultural lexicon for Mary Jane is, to say the least, robust; a shoe, Spiderman’s girlfriend, self-care techniques. And then there’s the Mary Jane of Winter Park, Colorado. “The Jane” gets its moniker from the O.G. Mary Jane, a savvy entrepreneur of the 1800s who provided warmth to many of the miners, rail yard workers, and loggers in the area. With a booming business, Mary Jane eventually became an early landowner at the base of the current property. To celebrate her ingenuity and the character Mary helped to instill in the area, Winter Park throws an annual January birthday bash in her honor, full-blown with a ceremonial mayor, ski races, costume parties, and plenty of feel-good revelry.